Are your job postings causing your company to miss out on the best candidates? Would you like to know how to write better job postings – the kind that help your company stand out from the competition? Many organizations make common and potentially costly mistakes when they list a job opening. If you don’t want to be among them, it’s important to remember that job postings are often an applicant’s first impression of your business. To attract top talent, it’s vital you make your job postings and descriptions concise, yet as interesting as possible. This is important in any economy, but it’s even more critical in a tight labor market. Just as you’re reviewing tens or hundreds of résumés, each applicant is probably reviewing about as many companies and job openings. And your job postings and descriptions are a determining factor with candidates when they’re deciding who they’ll apply with. So, how can you be sure you create job postings that make you stand out from the competition and appeal to the best and the brightest job seekers? Start with these seven smart steps for an immediate improvement. One of the fundamental mistakes many employers make is to simply pull up the job description – that document used to define the position internal to the organization and for performance appraisals – and post it online. The problem with this approach is that you’re taking a document primarily used for internal purposes and utilizing it for an external audience. A job description includes a detailed list of all the responsibilities and requirements for success in a particular position. For example, “make 20 cold calls per week” and “meet with 10 customers per week” are phrases you might see on a job description. In comparison, a job posting is a marketing tool that should paint a picture of what it’s like to work for your company in the role you’re filling. For instance, “You’ll call on our C-suite-level clients to explain our new supply chain technology” would be more appropriate wording for a job posting. A job description tends to be a dry recitation of responsibilities. A job posting needs to excite someone about your company and entice them to apply for your open position. That said, your job posting should still outline the required skills and duties for a role. But they should be presented in a way that resonates with prospective candidates and makes them want to work for you. Some companies create job titles intended to be fun, or that express disdain for tradition. If your business uses titles such as “marketing ninja” and “data guru” in online job postings, it may be at the expense of finding qualified candidates. Using these types of whimsical job titles may lighten the mood in the workplace. But job seekers will likely search using titles like “marketing director” or “strategic data manager,” which means your posting won’t appear on their search engine results page (SERP). Unclear job titles are detrimental to search engine optimization. Search engines and career listing websites use algorithms to help choose the most relevant search results. When applicants search for openings, confusing or non-standard titles will be listed lower in the results, or not at all. Remember, there’s no law that says your internal job title must be the same one you use when posting an opening. Use a traditional job title that prospective candidates understand and can find when they conduct a search. You’ll get better applicants, strengthen your employer brand and bolster your company’s reputation. If you need help, do some research to find out which job title best fits your opening, and use that title to help bring in the best candidates. Particularly if you’re hiring for a job that you don’t fully understand, it can be easy to rely on jargon and clichés. However, job postings full of unnecessarily complex, ambiguous or informal language are a turn-off to potential employees. Buzzwords such as “self-starter,” “leverage,” “execution,” “outstanding growth potential” and “viral” do little to explain the position or what a candidate’s life will be like if they work for your company. Clichés and slang may also carry unintended connotations or have different meanings to different people. For instance, “fast-paced” may be interpreted as “too much work for too few people.” “Be your own boss” may sound to candidates like their supervisor will never have time for them. And job seekers’ expectations of what “highly motivated” means may be vastly different from your own. Remember, a clear, precise job description eliminates confusion on what the role should be and whether the applicant is likely to be a good fit. With few exceptions, it’s a good idea to avoid acronyms and abbreviations in your job postings. Your company’s internal acronyms will likely have no meaning to outsiders and should be avoided. For instance, “M&A” may mean “mergers and acquisitions” to you, but it could mean “marketing and advertising” or “managers and associates” to someone else. Even industry acronyms and abbreviations should be minimized to improve readability and search results. One of the few exceptions to this rule of thumb is “IT,” as it’s an acronym that is widely known and understood. And don’t forget the Boolean basics. Abbreviations impact how and if you appear in an applicant’s search results. Say, for example, you’re seeking someone with Sarbanes-Oxley experience and only use the abbreviation “SOX” in your job posting. You’re assuming that every applicant with Sarbanes-Oxley experience will type in “SOX” when searching for job listings. Job seekers who search for “Sarbanes” or “Sarbanes-Oxley” won’t find your job posting. Abbreviations don’t mean your listing won’t be posted, or that it won’t be searchable. But it will be more difficult for prospective applicants to find you. This can hurt your chances of landing the most qualified candidate. Historically, candidates had to sell themselves to a company – explain why they’re the best person for the job. In recent years, there’s been a shift. Now, we’re in an era when candidates expect you to sell them on your company. As the employer, you’ve got to grab their attention immediately. If your job posting is too stuffy or formal, candidates will question your company culture. They may believe it’s a reflection of their future work experience, should they decide to work for you (and be hired). In a candidate’s eyes, for instance, a formally written job advertisement might indicate an unfriendly atmosphere where employees are subject to stringent rules and a litany of restrictions. And selling your company doesn’t end with the online job posting. It’s equally important to have a strong web presence – and that your job posting and website both accurately reflect your company culture and mission. If you pass first inspection with a brief, engaging job posting, you must be ready for your candidates’ next move – a visit to your website and social media profiles. If your website looks like it was built in 1999, or your last tweet was posted in 2013, they’ll probably move on without applying. For many candidates, these are major red flags. If you haven’t put in the resources to have a modern website or update your social channels, candidates may assume you won’t invest in their success either. Typos and unclear job descriptions will scare away applicants and can harm your company’s reputation. Would you apply for a job opening seeking someone “capable of ruining an office?” What about applying for a “resauce” or “purrchaysing manger” position? Neither will your prospective candidates. Spelling and grammar mistakes discredit your company, decrease the readability of your job postings, and make it difficult for your position to appear in a search. Don’t let easily avoidable errors keep quality candidates from applying for your job opening. Job postings with too many mistakes could be seen as fraudulent and can hurt your brand. Have at least one person in your office proofread your job posting before you make it public. Most people now use their smartphones for a significant portion of their web browsing. This means any potential applicants will likely read your job posting on their phone. That’s why your job postings must be mobile friendly. These small screens require you to use fewer words, shorter paragraphs and concise messaging. There’s no need to include your company’s history since its founding. Job postings that are too long will be skipped because candidates will get tired of scrolling and move on to the next listing. The shorter that scroll time, the better. It’s important to keep in mind that many job searchers will bypass your introductory text and scroll straight to the job description and requirements. Paint a quick picture of the job, with the most essential details, and include your company website. If the position sounds interesting, candidates will want to learn more about your company and its culture on your website or job landing page. While you’re at it, consider updating older job postings to be mobile friendly, even if a position isn’t currently open. This way, you’re prepared if an employee leaves or you need to back-fill a position. Knowing how to write better job postings is just one of many strategies for attracting and retaining top talent. 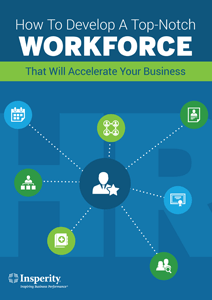 Learn more by downloading our free e-book, How to develop a top-notch workforce that will accelerate your business.